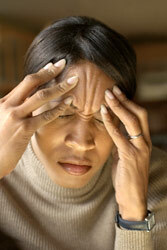 Most headaches come from spinal misalignments in the neck. Even migraines can be helped with spinal manipulation. 90 per cent of all headaches however are tension headaches and 90 per cent of those can be stopped very quickly with my 2 minute headache removal technique. I was taught this by Dr Richard Yennie, DC, LAC way back in school. No need to suffer. Since I have been treated by Dr Klayman for symptoms related to misalignments and allergy as well, I feel much, much better now. As a matter of fact, as soon as Dr Klayman treats me, the symptoms disappear almost instantly. I feel my life is back when I leave the office. Also he has a great sense of humor, which helps me to relax and enjoy the visit. Dr Klayman is like a magician. The treatment works. He is the greatest!